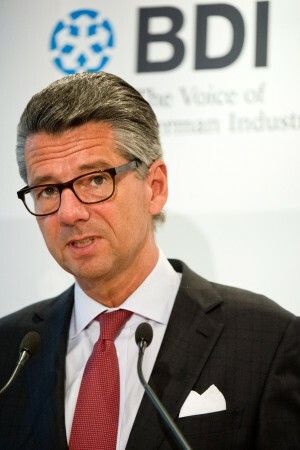 A powerful German business leader slammed a growing anti-Islam movement in the country on Tuesday, saying Europe’s top economy needed more immigration to remain competitive and should take in more asylum seekers. The president of the German Federation of Industry, Ulrich Grillo, said the emergence of the group “Patriotic Europeans Against the Islamisation of the Occident” or PEGIDA, which has been holding weekly marches, was undermining the country’s interests and values. Grillo blasted the PEGIDA protests, which organisers have billed as a grassroots movement, calling participants “neo-Nazis and xenophobes”. He said the group was trying to harness fears of Islamist terrorism “to smear a whole religion” which he called “unacceptable”. Grillo’s federation represents the political interests of more than 100,000 companies employing around eight million people. He said Germany’s rapidly ageing population needed a strong influx of qualified newcomers to support the economy and the social welfare system. “Considering our demographic development, immigration ensures growth and prosperity,” he said. He urged political leaders to do more to stand up to PEGIDA. “The political class has got to try harder to make citizens see the opportunities and diminish their fears,” he said. The government’s top official for integration, Aydan Ozoguz, agreed that Berlin could not afford to simply wait for PEGIDA to fade away. “We need to do more to educate people. That takes longer but has a longer-term impact,” she told AFP. Ozoguz attributed PEGIDA’s rise to everything from “personal fears of slipping living standards to the fear of becoming an ethnic minority to a vague fear of Islam”. A record 17,500 people joined a PEGIDA march against the “Islamisation” of Germany in the eastern city of Dresden late Monday in the 10th demonstration in as many weeks, with smaller clone groups rallying in three western cities. About 4,500 people marched in a counter demonstration under the slogan “Dresden Nazi-free”, warning that there was no room for racism and xenophobia in the country that perpetrated the Holocaust. The movement has emerged at a time when Germany, which has fared better economically than most of its eurozone partners, has become the continent’s top destination for asylum seekers, and the world’s number two destination for migrants after the United States. PEGIDA said it would not hold a rally next Monday, between Christmas and New Year’s Day, in order to give police guarding the protests a break.